I love poetry. Poems are a great source of inspiration for me. During 2018, I’m working to memorize my favorites. I work on the memorizing every morning while doing “ball planks,” which are part of my weekday morning rituals. I will turn 50 in June, and memorizing is apparently helps keep sharp an aging brain. 🙂 Mostly, though, I’m memorizing these so I have them with me at all times without having to carry printouts of the poems. This is my first of what will be a series of videos of me trying to recite a poem by memory. Appropriately, my first effort is my favorite poem, “The Summer Day,” by Mary Oliver. Yeehaw! At the top of Wyoming, on Gannett Peak. As I write this, I feel exhilarated and inspired. You see, I got to stand at the top of Wyoming’s tallest mountain, Gannett Peak, last Thursday. And, just so you know, this is a very long blog post. As Mark Twain said, I would have written less, but I didn’t have time. I am behind at work from being in the wilds for 6 days, and yet I wanted to capture this experience, and to share it with others, while it’s so fresh in my mind. So, thank you in advance if you read what is a long-form article. The very isolated Gannett Peak stands 13,809’ tall. 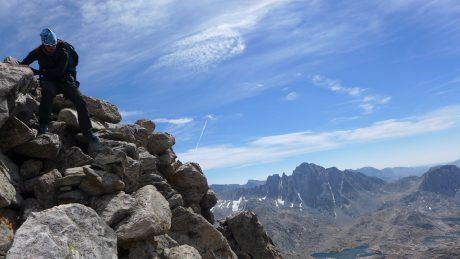 It is the high point in all of Wyoming, and that fact is what draws many to the area to climb the mountain. For the record, Gannett’s status as being the high point in Wyoming is actually not the main reason I wanted to climb it. I was most interested in seeing what is very much, despite its height, a “hidden” mountain. I also wanted to see and travel over some of the last remaining glaciers in the Lower 48, including Gannett Glacier, on the north side of the peak, which is apparently the largest glacier in the Rocky Mountains south of the Canadian border. I’m always looking for interesting experiences, and climbing Gannett fit the bill, and then some. 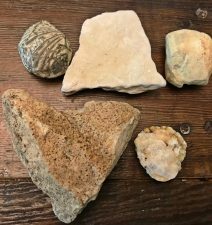 I am in mountain climbing shape, and have years of backpacking experience, but I don’t have technical mountaineering expertise. 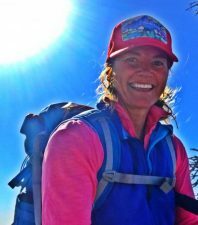 So to climb Gannett, I signed on with Jackson Hole Mountain Guides for a guided expedition. Nate Opp would be our guide. Nate was one of the guides who led me up the Grand Teton in 2009, and I like his style, so I was psyched he would be the one facilitating the meaningful adventure for us. But when I looked at the maps, six days made perfect sense. Anything less than that, from the West side, seemed almost unreasonable, given variables like the weather, and snow depths and conditions, the altitude, etc. I could have signed on with another reputable company and approached from the East side, which was closer to my home of Lander, and the expedition would have required only 5 days’ time. 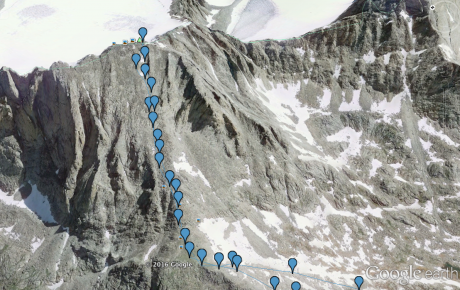 But when I saw the route from the West approach, and realized it went through Titcomb Basin, I was even more excited. 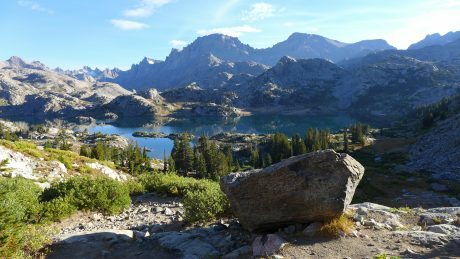 I had been into Island Lake and into Indian Basin (and up Fremont Peak) before and it is one of the most stunning regions I have ever seen. Nate, Robert and Rick, hiking alongside Seneca Lake on Day 1. Island Lake, reached at about 11 miles. We hiked efficiently and arrived, and had our tents pitched by 3pm. I lounged around like a marmot on a big slab of granite under the warmth of the sun, while drinking in the waterfall soundtrack and the breathtaking views. Not too shabby of a campsite. We’d camp here on nights 1 and 5. The lounging lasted only an hour or so before the weather changed drastically, and we raced for our tents. While in my tent, thunder echoed raucously against the granite towers that surrounded us, followed by lightning that lit up my tent. I am terrified by lightning, and this reminded me of a night at Clear Lake with my family that was the most scary night of our lives. That night, lightning lit up our tent repeatedly and thunder roared as rain poured down for several hours. I never prayed so hard, and it felt miraculous that we had survived the night. I had hoped to never find myself so high up in a tent under those circumstances again, which I know is an unrealistic hope. If I am going to play in the high country, there will almost certainly be some thunder and lightning. (And it didn’t help that I recently read the fantastic book, A Bolt from the Blue, about the terrifying (and heroic) rescue in 2003 at 13,000′ on the Grand Teton. The page-turner-of-a-book tells the true story about a colossal lightning bolt that struck and pounded through the body of every climber in a group of six. I know, I know – these things are not helpful when laying alone in a tent at 10,500′ that is getting lit up by lightning just seconds after raucous thunder echoes against the nearby granite mountains… I work with leaders and coach people all the time about the opportunity we have to “choose our mindset.” The late Viktor Frankl, an Austrian psychiatrist and a Nazi concentration camp survivor who wrote the influential Man’s Search for Meaning, argued that the last of the human freedoms that cannot be taken from us is our choosing how we will respond to our circumstances. I remembered this, and the work I do, and tried to change my “I’m going to be struck by lightning and die out here” mindset to “What a spectacular storm!” mindset. It didn’t work, but it wasn’t for a lack of effort. So I lay there, uneasy and a little bummed that this adventure was off to this kind of start. I got out my journal and found notes from each of my three sons and my husband in the back. I read those a few times, and felt comforted. I know how blessed I am to have a family who supports these epic adventures of mine, and their thoughtfulness touched me. Luckily, the storm was short-lived. After about an hour and a half, the storm passed through, and we had blue sky and sunshine again. I was getting to know Rick and Robert by now. After hiking several miles together, and now having shared our first meal together, we were acquaintances. I liked them immediately. They are kind, Southern gentlemen. 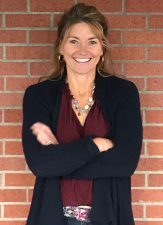 For the first time since starting Epic Life Inc., I chose to forego leading my flagship program, Epic Women, this summer. 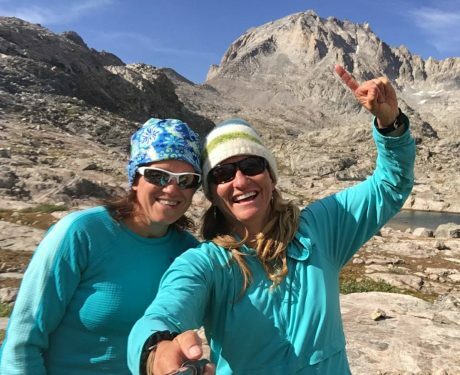 Every year at this time, I am leading my Epic Women expedition in the Wind Rivers. 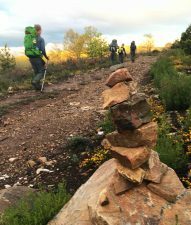 I coach women individually for several months, and then they all come together to meet for the first time, and we go into the wilderness to backpack and climb mountains. This year, I wanted to do something personal instead. I was longing to do something new, and that would challenge me and expand my abilities. I also wanted to see some new sights, get inspired, to enjoy some solitude, and to not be in charge. Robert and Rick are both avid drummers and musicians, and that’s how they originally met. 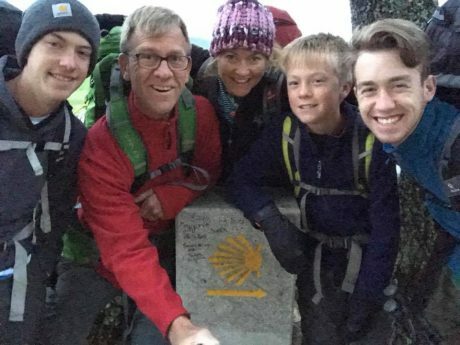 For the last 10-12 years, they’ve been traveling the country bagging the high point in each of the states in the Lower 48. If they could stand on Gannett, it would mark their 47th of 48 high points. Day 2: We woke up at 7am, and had coffee while Nate cooked us a great breakfast of Huevos Rancheros. 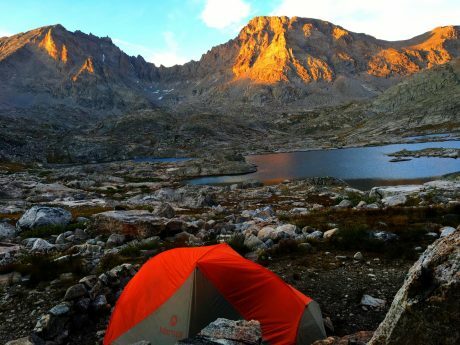 Mid-morning, we broke camp, and backpacked to the uppermost reaches of Titcomb Basin. 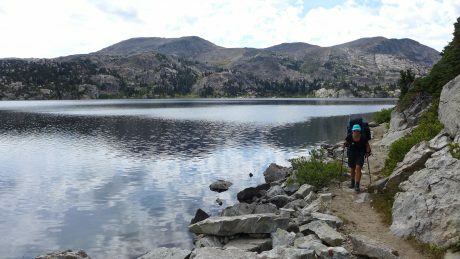 We hiked through wildflowers, snow, and alongside several lakes that were smooth as glass and that reflected the snow-capped, looming granite peaks in their waters. I was captivated the entire way. 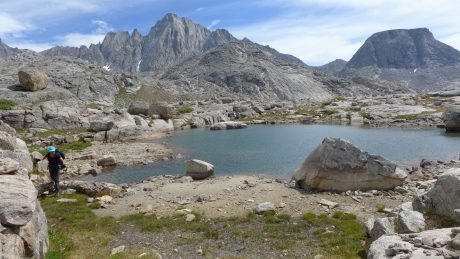 I’ve got many favorite trails and areas in my beloved Wind Rivers, and Titcomb Basin is at, or near, the very top of that list. It is incredible. 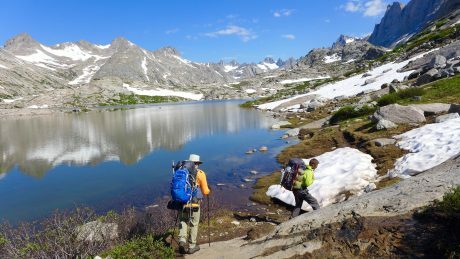 Nate and Robert, hiking past one of the many upper Titcomb Basin lakes. Nate Opp, our very capable guide from Jackson Hole Mountain Guides. It’s impossible to not feel tiny in this country. And, as writer Cheryl Strayed so eloquently wrote, this has the reverse effect of making me feel gigantic inside. Huge, granite mountains towered above us as we hiked, and only a wide angle lens has any chance of capturing the alpine tundra, lakes and mountains in a single shot. I spied these goats near our camp in the upper reaches of Titcomb Basin. After about 6 miles, we pitched our tents as close to the base of Bonney Pass as possible. Ours was truly one of the most scenic campsites I have ever enjoyed. We were right under the towering Mt. Helen, and other tall peaks. As I was pitching my tent, I spied movement out of the side of my eye. It was a herd of about 20 goats –- bighorn sheep ewes? I wandered quietly toward them and was able to watch them for some minutes. (see photo or video) We were all excited to see the wildlife, as we had only seen some songbirds, squirrels, marmots and pika, and weren’t expecting to see much in the way of wildlife on this trip. Our tents were right underneath Mt. Helen, lit up by evening alpenglow here. 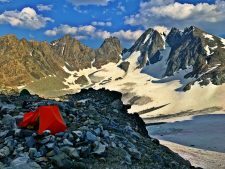 Our camp was surrounded by massive snow fields that adorned the towering peaks that jutted up from the alpine tundra all around us. We had a huge winter in Wyoming this year, and there was still abundant, melting snow all around us. 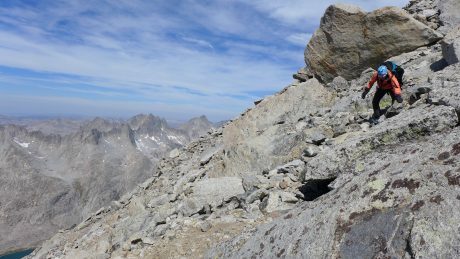 And, close in our sight, was what would be one of the cruxes of our Gannett Peak summit ascent– Bonney (Dinwoody) Pass. The pass is about 1,200 feet tall, and it’s steep (like in 45 degrees? steep), and mostly covered in snow. I have fitness for hiking up steep hills, but this would be different. We’d have crampons and helmets on. We’d be roped up. We’d have our ice axe at the ready for self arrest, and it would be, well, a serious undertaking, with high consequence should something go wrong. 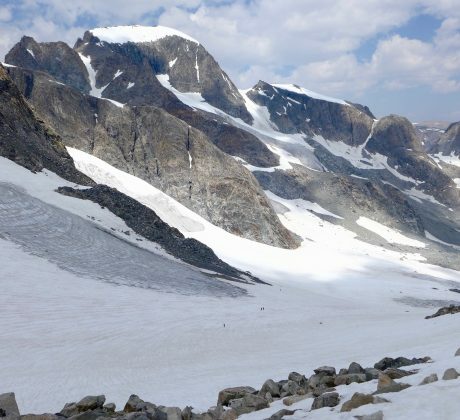 The other thing about approaching and summiting Gannett from the West side is you have to not only go up Bonney pass, but down it, and across Dinwoody Glacier before you go up to Gannett’s summit. And, well, what goes up and down and up, goes down and up and down on the way back. It would be a truckload of hard-earned effort, and all of it technical and with high consequence. I’ve hiked literally thousands of miles in these Wind River mountains during the last 20 years, but never had I spied with my own eyes the state’s tallest peak. Gannett is remote, and very much hidden. So while I was a bit afraid of the task of ascending the steep pass, I could hardly contain my excitement for the sight that awaited me once we crested it. Not only would I see Gannett Peak, but the map I studied indicated the view I’d get from the top of the pass would be full of glaciers. 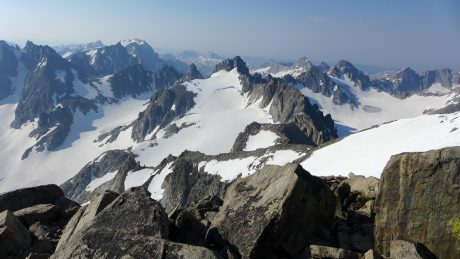 Last year, I climbed Fremont Peak with a friend, and was blown away when we got to the top of Fremont, and was rewarded by sights of the huge Fremont Glacier, and other glaciers in the distance. That sight had whetted my appetite. I wanted to see more glaciers in my backyard. We enjoyed another great dinner that night, and we all talked nervously, but excitedly, about the next day’s plan. I didn’t sleep a wink on night 2 because I just couldn’t wait to see Gannett Peak for the first time. I was just too excited for slumber. Day 3: Whenever I’m traveling, or camping in the wilderness, upon first waking, I always am a little disoriented and have to quickly search my brain for where I’m at. 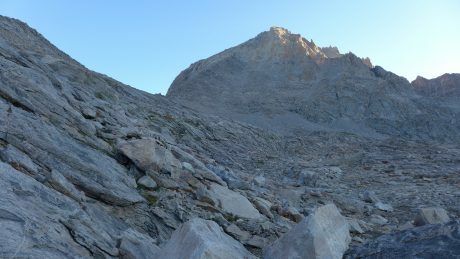 As my eyes first opened on Day 3, and I remembered where I was and what I was doing in Titcomb Basin, the above wise words are what came to mind. The late Todd Skinner was a friend, and a climbing legend, and an inspiration to so many. Today would be the first day of this expedition to really test my mettle. I have leveled up my whole life. By leveling up, I mean I have signed up for or tried things I didn’t have the skills to do. Even though I may look like a fool, stumble, or fail, I believe in doing hard stuff. Abraham Maslow called it self actualizing, when we become actually what we are potentially. We can’t ever realize our potential without leveling up and daring to fail and doing hard stuff we don’t know exactly how to do. In short, I get a lot of fulfillment out of learning, and whenever I level up, I am guaranteed to learn new skills, not to mention more about myself. Although we wouldn’t climb the mountain until Day 4, we’d start our “climb” today, on Bonney Pass. I was uncomfortable just thinking about what would be required. But as Todd said, we cannot lower the mountain, we have to rise up to meet it. We were all up early, and Nate had coffee on for us before feeding us a breakfast that included bacon. Yes – you read correctly, bacon! Those who know me know that bacon is one of my favorite foods, so this made me extremely happy. The day was already a winner. Nate was one of the guides who helped lead me to the Grand Teton’s summit in 2009. I like his style, and he’s very experienced, so although our adventure was full of uncertainties, one certainty was that we were in very capable hands. During the previous day, and again over breakfast on Day 3, Nate shared and reviewed his vision for our expedition, which was to “slim our loads way down,” making them as light as possible while still carrying tent and sleeping bag, cook stove and food and clothing layers. 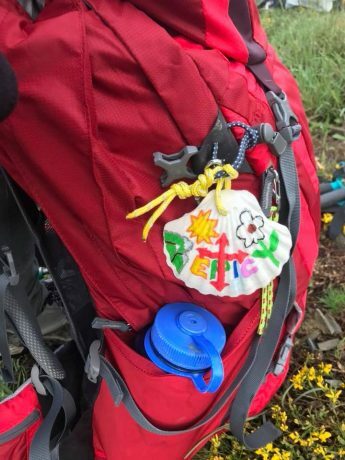 We’d take our slimmed-down backpacks up and over Bonney Pass, down and across Dinwoody Glacier, before ascending a small outcropped ridge that’s situated about 2,000’ below Gannett Peak. There, we’d put in a camp for the short night before our summit attempt. Nate explained this would make for a more reasonable summit day on Day 4, not to mention a richer overall experience. 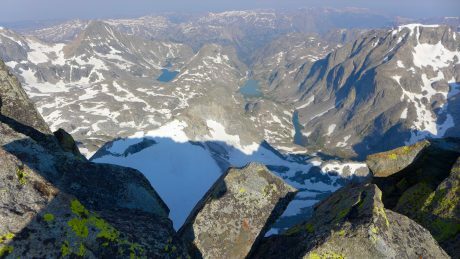 (Many who approach from the West side, via Elkhart Park, go up and over Bonney pass, across Dinwoody Glacier, then up to Gannett’s summit, and then all the way back. It can make for a 14-hour day for the most fit, and a 20-hour day for “average” adventurers, especially for those coming from sea level.) Even if we had the fitness for it, it didn’t sound very appealing, and Nate’s vision and reasoning were compelling. 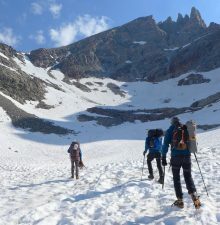 After breakfast and reviewing our plan, we cached the food and supplies we chose to leave behind, put our crampons and helmets on, and headed toward Bonney Pass. At first it was easy going. We walked on a gradual uphill to the base of Bonney Pass, and I got used to walking on snow while wearing crampons. Once at the base of the pass, Nate roped us up and gave us some instructions. 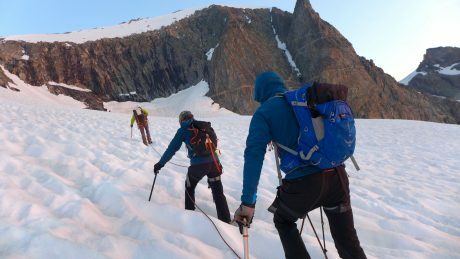 Mountaineers rope up to mitigate the risk of of falling on steep, hard snow or ending up in a crevasse. 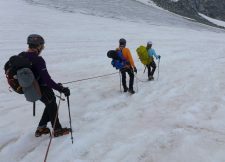 Should a person fall on a steep snow slope, someone, or all, in the roped group will help to use their ice axes to stop the person from falling and/or pulling everyone down the slope with them. Or, if a person were to fall into a crevasse while traversing a glacier, being roped up and spread out will hopefully prevent that person from falling to his/her death or from suffering serious injury. Roped up and making our way up the steep Bonney Pass. Nate explained we should keep the rope between each of us taut, not slack. Rick and Robert had much more experience with this kind of travel than I did. (They recently summited Mt. Rainier and Mt. Hood.) For me, this roped travel took some practice, but we were soon moving in a pretty good rhythm up Bonney Pass. This day’s effort would be a quiet one. 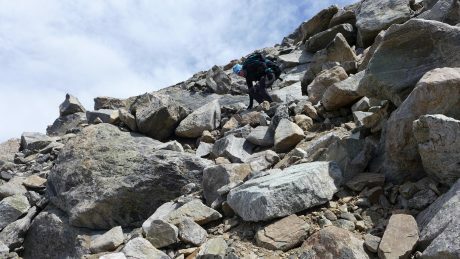 There’s not a lot of chit-chatting when you’re mountaineering over terrain that is treacherous, and where the risks are high. Intense focus is required. Your mind doesn’t wander. It can’t, and it doesn’t want to. Thankfully. When we got about two-thirds of the way up the pass, Nate suggested we move to the rocks on the left to finish our ascent of Bonney Pass. 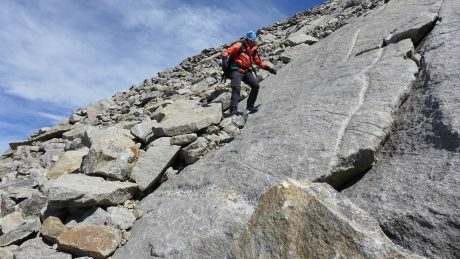 Even though the rock was loose and the slope steep, with its own set of dangers, Nate explained the risk was less significant than a fall on the steep snow slope from upper Bonney Pass. 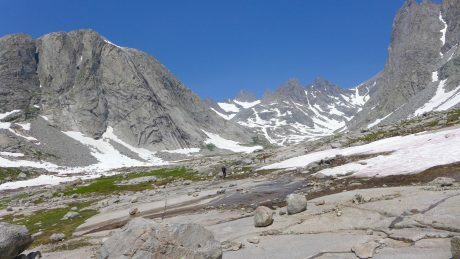 So we de-cramponed, and while remaining roped together, scrambled our way up through boulders and over loose rock until we reached the top of Bonney Pass. At the top, we unroped, and Nate instructed us that once we crested the pass, we should take a load off for a few minutes to drink some water and eat a snack. Gannett Peak gets it name from Henry Gannett, who was an American geographer who is described as the “Father of the Quadrangle,” which is the basis for topographical maps in the United States. 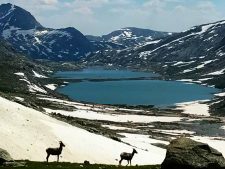 With 290 miles of isolation from a higher peak, Gannett is the most isolated peak in Wyoming, and the ninth-most isolated peak in the contiguous United States. With 7,076′ of clean prominence, the mountain is the most prominent peak in Wyoming. It was certainly prominent as I looked at it, in awe. We didn’t linger because we had a tall order ahead still, and an even taller order the next day. We finished our break, and put on our crampons again. Nate told me I’d go first on the descent. I don’t have much experience with crampons, let alone leading a group of people down a very steep and snow-covered mountain pass. 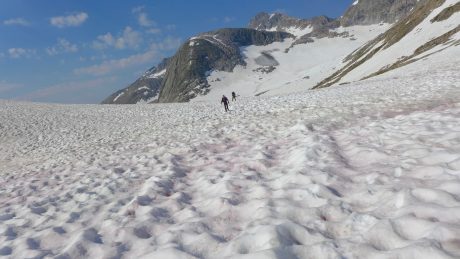 I used crampons briefly, while ascending and descending a gully on my Mt. 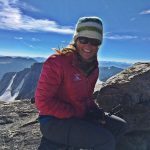 Whitney mountaineering expedition a few years ago, and briefly on my 2009 Grand Teton expedition, but nothing to this extent. Did I mention how steep it was? When I asked how to proceed, Nate suggested I just go straight down the pass, with no switchbacking. To start, just try digging your heels in, he said. 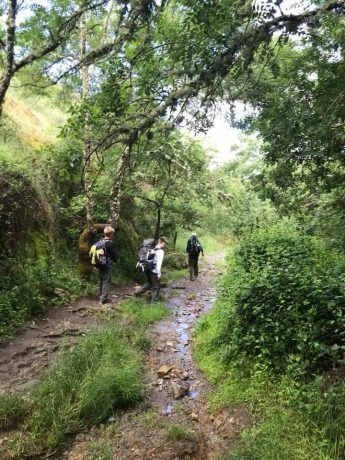 I used an ice axe in one hand and a trekking pole in the other to help balance myself, and away we went, slowly but surely, down Bonney’s very steep back side. Me, on the lead, after descending Bonney Pass and heading across Dinwoody Glacier toward Gannett. Up ahead, I could see several individuals coming toward us, spread out, appearing as tiny as ants, traversing Dinwoody Glacier. The snowy slope we descended was full of “snow cups.” The sculpted cupped pattern of the snow resembled ocean ripples, only these were white snow ripples. 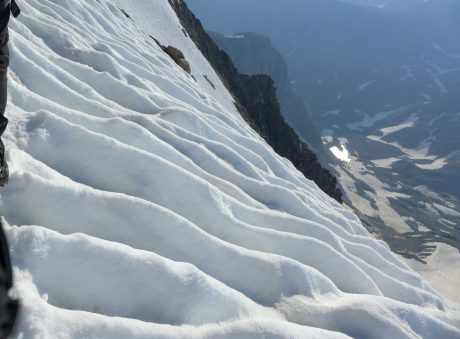 Often, the snowy slopes we traversed, or ascended and descended, resembled corduroy with extra tall “ribs” that stretched the entire vertical length of the slope. It was beautiful. By the way, four different times during a two-day period, I saw people I know. The Wind Rivers are vast, and remote, and no matter how many people I might know, I’m always surprised when I see someone I know in the remote reaches of the Wind Rivers. As we made our way down and across the lower portion of Dinwoody Glacier, we passed a guide who was roped up to a client. “Hi Shelli,” the client said. I didn’t recognize him at first because he had a helmet and glasses on, so I said, “Who’s that?” It was Kirk VanSlyke, a former Lander man who was a few classes ahead of me in high school. He now lives with his family in Dillon, MT. As we continued, silence returned. The day’s work was quiet work. All I could hear was what would become a very familiar soundscape over the next several hours – our measured breathing, and the repeated sounds of our ice axes and crampons digging into the snow. I noticed the longer I spent attached, literally, to Robert, Rick and Nate, the more connected I felt to them. Each of our safety depended on one another, and even though there weren’t a lot of words spoken when traveling over and through such high consequence terrain, a bond was developing over the course of our expedition. I could feel it, and found comfort in the fact that these guys had my back, and me, theirs. I also found the single-minded, single-tasking a welcome reprieve from my busy mind. My mind is always thinking and tends to be future-oriented. Traveling on snow and up and down steep terrain, roped to one another, forced me to focus on only the next step, and then the next step, and then next step, for hours at a stretch. It was hard, but also unusual for me – and fantastic. The simplicity of it all was refreshing. By 2:30pm, we reached the spot at almost 12,000’, situated directly under Gannett Peak, where we would pitch our tents for the short night. This was one of the most scenic campsites I’ve ever had. My tent was pitched under Gannett Peak, which I could clearly see, and on one side was Dinwoody Glacier, and on the other was Gannett Glacier. The rest of the scene was filled in by other glaciers, snow fields and tall, towering granite peaks. Once we were out of our crampons and on level ground and safe and sound for the time being, I reflected on the day’s adventure. I felt exhilarated. 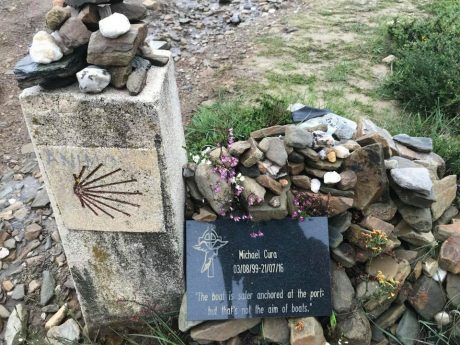 It was a day of leveling up, of seeing new and astonishing sights, and I was filled with anticipation, and nerves, about the summit attempt that was only hours away. We ate an early dinner that hit the spot – cheesy potato soup with sausage and bacon bits. (Nate’s a great cook!) We reflected on the day’s effort, and agreed on a wakeup time of 3:30am for our summit day. The afternoon and evening were stellar. Blue sky, a fantastic warm and bright orange sunset, and a bright moon bid us good night as we headed into our tents early. Day 4: At 3:30am, I woke up from not sleeping, and stumbled out of my tent with my headlamp on to find Nate boiling water for coffee and a quick oatmeal breakfast for us. I have always wanted to climb things so I can see what the view is from “up there.” Today, specifically, I hoped to stand at the very top of Wyoming. 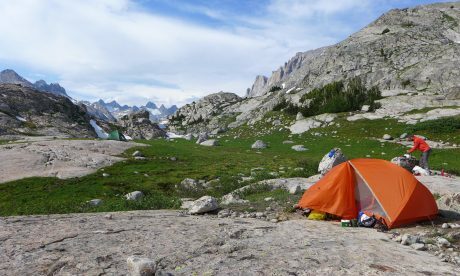 Our plan was challenging, yet simple: We’d summit Gannett, then return to our tents, break camp as quickly as possible, and continue down and across Dinwoody Glacier, and up and over Bonney Pass. If it was just a matter of fitness, it wouldn’t be that big of a day. It would be hard, but not exceptional. But we had all kinds of variables to consider, not to mention risks. 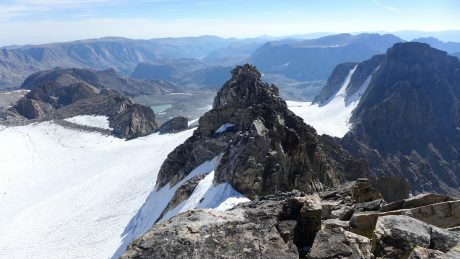 We’d be walking across and up snow, across and up glaciers, including the very steep Gooseneck Glacier, scrambling up steep sections of boulders and loose rock, and along Gannett’s exposed ridge which marks the final stretch to the mountain’s summit. And that would be just for the summiting portion. Then we’d reverse all of that, plus add some glacier travel, and a steep and high consequence ascent and descent of Bonney Pass at the very end of our day. I won’t lie, part of why I signed up for a Gannett Peak climb was to push my limits. I wanted to step forward into growth a lot on this trip, and I knew today would deliver that, and then some. At 5am, with headlamps, crampons and light packs on, we started up the snow to start our ascent of Gannett. After about 10 minutes of snow travel, we removed our crampons, restocked our water bottles from a spring, and then, roped up, and followed Nate up a steep section of boulders and loose rock. My trail name is “Sunrise.” I got this name because the first light of day is my favorite time of day, and I often insist on starting in the dark so I can be in the wilderness or on the mountain when the sun comes up. So I was a happy camper when we were soon rewarded with a glorious sunrise! (Watching the sunrise made me recall the words of one of my favorite poems, Why I Wake Early, by Mary Oliver, which I know by heart: Hello, sun in my face | Hello, you who made the morning and spread it over the fields and into the faces of the tulips and the nodding morning glories, and into the windows of, even, the miserable and the crotchety – best preacher that ever was, dear star, that just happens to be where you are in the universe to keep us from ever-darkness, to ease us with warm touching, to hold us in the great hands of light – good morning, good morning, good morning. Watch, now, how I start the day in happiness, in kindness. Me, very happy because it’s sunrise AND I’m climbing a mountain, two things I love dearly. 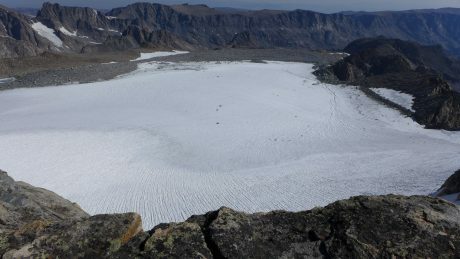 Next, we crossed a section of snow toward what’s known as the Gooseneck Glacier bergschrund, a crevasse that opens as the summer gets going and the snow melts. Lucky for us, while the bergschrund was starting to open, it had a “snowbridge”near/over it making it passable. The crux of the route begins here. 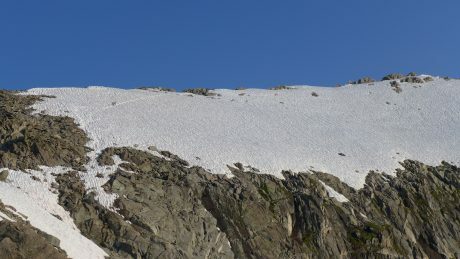 The Gooseneck Glacier / couloir is steep and narrow, and makes your stomach turn when you look down and imagine the what ifs. I took a deep breath, and took some of the most deliberate steps of my life. Making our way around the thankfully-not-yet-completely-opened bergschrund on Gooseneck Glacier. Headed toward the summit, which you can see at top center of the photo. This is a photo of the final ridge line approach to Gannett’s summit. Look very closely at the upper left to see two mountaineers en route to the summit. After getting up and through that section, we returned to class 3 rock scrambling, all the way up to the snow-covered face of Gannett, where we put our crampons back on to walk the ridge line to the summit. The final stretch was one of my favorite parts, and certainly one of the most exhilarating. 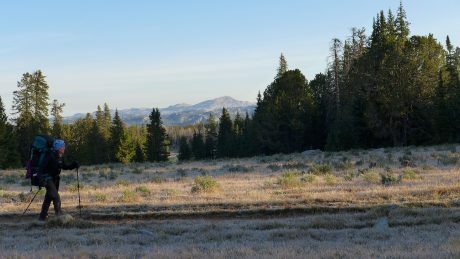 The ridge is narrow, and on the left you can enjoy summit views of lakes and mountains everywhere below. As we made our way to the summit, we’d get glimpses through the rocky ridge on our left to all that was below and beyond. To our right was a steep, completely exposed, snow-covered face. Steep and exposed, and beautiful snow patterns from the final ridge that leads to Gannett Peak’s top. Compared to the rest of the effort, the final stretch to the summit is pretty level, even if it’s extremely exposed. I always feel at my fullest potential right before summiting – when the summit is in reach and right before I stand on it. I felt as though I was on top of the world, even if it was actually just on top my beloved state of Wyoming. Yeehaw! Posing with Robert and Rick on the summit of Wyoming’s highest point. One of our summit views. In our case, we had to descend the mountain, break down our camp, and go down, and then up steep Bonney Pass and then descend the steep and treacherous Bonney Pass and eventually get back to our camp, hopefully in one piece, and hopefully before any significant changes in weather. It was a tall order. So we celebrated on top of Gannett, but not for too long, before descending, very carefully, 2,000’ to our tents. We were methodical and efficient in our descent. After breaking down our camp in short order, we started our return journey. Just as we imagined, ascending Bonney Pass was a grunt. 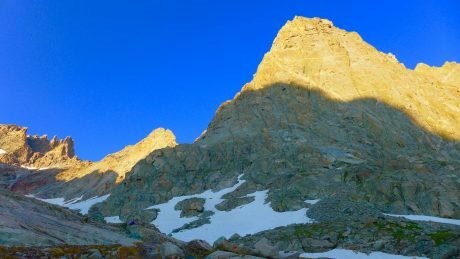 We took a very short break at the top, and then braced ourselves for what Nate suggested might be the biggest crux of our day – getting safely down a treacherous Bonney Pass on tired legs and lungs. 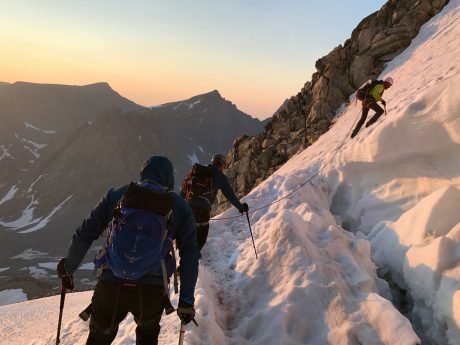 We remained roped up, but removed our crampons at the top of the pass, and followed Nate’s lead down a bunch of rock to mitigate the risk of a steep and dangerous fall on the top of Bonney Pass. About halfway down Bonney, we put our crampons back on and I took the lead and down we went, slowly, but steadily, so as to get this day’s adventure behind us as safely and as soon as possible. We managed to get back to our main camp at the upper most reaches of Titcomb Basin by 5:30pm. 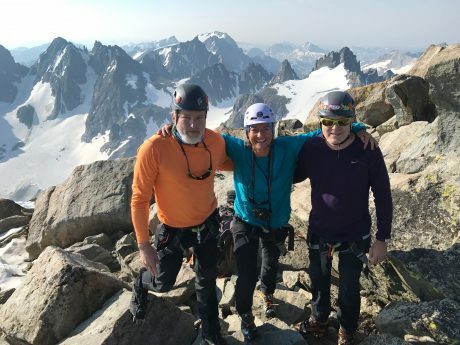 We were all pretty wiped out, but it was great to be on firm and level ground, and finally, to fully celebrate what we had accomplished – standing on the top of Gannett Peak! As per usual, Nate spoiled us with another hearty dinner. This time it was stuffing, mashed potatoes and gravy. We all ate as if we were very hungry mountaineers. It was a great feast, and we all recalled and replayed the events of the day. We were all filled with joy, but also a sense of relief. We had had success, and suffered no injuries or tragedies. Recently, I’ve read books about flow, including The Rise of Superman, and a more recent follow up book, Stealing Fire. 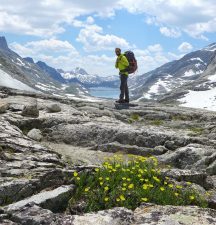 There are 17 triggers that can lead to flow state, and by all indications, this mountaineering experience we were having included several of them. One thing that is required to reach the flow state of mind is intensely focused attention. Check. Another flow trigger is having a clear goal. Check. We were very clear about our goal. There was no wondering about what our plan was each day on the expedition. Another trigger is the challenge-to-skill ratio. Check. For flow to occur, you need to be doing something that is harder than you’re capable of doing – that requires skills you may not yet have. This will prevent boredom while keeping you engaged and at attention for long periods of time. Another requirement for flow is high consequence. Check. Since we left our camp in the morning, every single step we took, and there were thousands according to my FitBit, were of high consequence. Rich environment is another flow requirement. Check. We were surrounded by a unique environment, rich in glaciers and tall and beautiful mountain peaks. Deep embodiment is another flow trigger. Once again, check. Deep embodiment means total physical awareness. This is when we harness the power of our whole body and pay attention to the task at hand. This also means paying attention to multiple sensory streams at once. No question, my senses were heightened every step on this day. 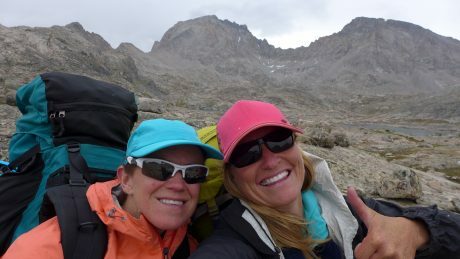 I never felt so alive… even if I was mentally exhausted when we finally returned to our Upper Titcomb Basin camp. While it was a physical endeavor for me, Gannett taxed me mentally more than it did physically. So no surprise, once I could let my mind loose, I slept. Hard. We all slept in, and it was a blissful experience. We had coffee and ate breakfast, and had one of many great mealtime conversations. As is often the case, the deeper we got into the expedition, the more we each let our guards down, and the more meaningful our conversations became. Around lunch-time, we broke camp and started our 6-mile hike back to our original camp. We all were still high from our accomplishment and the shared experience. Since today’s was a hike rather than a mountain climb, there were more words. At times we hiked together, but at others we spread out. 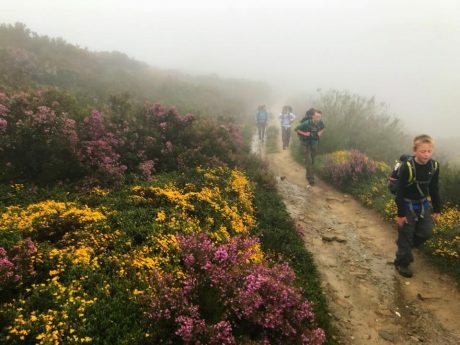 I don’t know about Rick, Robert and Nate, but I spent my hike on Day 5 replaying the previous days’ events, and recalling the scenery I saw, and also taking notice of all of my spectacular surroundings. I often go to the wilderness to be alone. I think Solitude is the medium for self realization, and I often yearn for time alone. I have a lot of natural enthusiasm and energy, but I also suffer depressive periods every now and again. I know from experience that getting away and going into the wilds is medicine for my soul. I think about this as I walk alone ahead of the group on Day 5. These days in the wilderness have done me good. 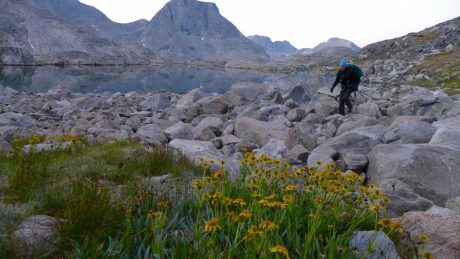 Robert and Rick make their way out of upper Titcomb Basin, as we head toward our last night’s camp. I knew I would return from this trip as more than I was before. We had a glorious last night in the wilderness. We had a pasta dinner, and chocolate for dessert, and then enjoyed a sunset that painted the granite walls and peaks around us a deep pinkish-orange. The moon was bright, and almost full. Rick and Robert and I enjoyed the sunset together, and shared more stories and memories with one another, in between our reflections of what we had all experienced and accomplished together. I went to my tent feeling extra blessed. 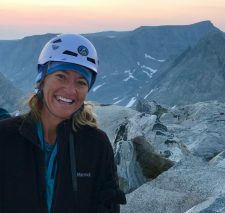 I had not only climbed Wyoming’s tallest mountain, but I also made two new friends, and reconnected with a guide I deeply respect. 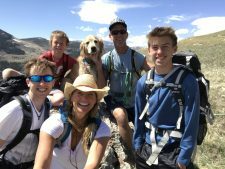 I especially felt grateful for my family, who lovingly supports these adventures I want to experience, and felt, once again, restored and rejuvenated by my beloved Wind River mountains. Day 6: Our last day’s hike out was about 13 miles. I couldn’t wait to see Jerry and the boys. They hiked in to meet me when I had about two miles left. They are the best support team a person could ever dream of having and I had a few happy tears when I spied them coming toward me. (Side note: I was hiking particularly fast on this last day not only because I was eager to be reunited with my family, but also because I was chasing/trying to hunt down a friend of mine that I’ve never met in person. Her name is Kara, and she lives in New York. We have common interests and some mutual friends. 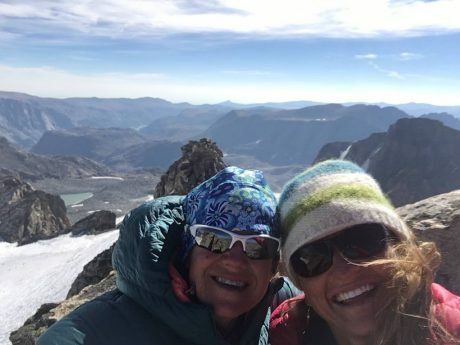 Before our respective expeditions, we compared notes and discovered we’d both be somewhere in the Titcomb Basin region on Aug. 4 and early on the 5th. I looked for her on the trail on Aug. 4, but to no avail, and I tried to catch her on my hike out on Aug. 5. I had asked many incoming hikers if they had seen a group of four women, including one with braids and a headband, which is how Kara described herself when we agreed by email to look for each other “out there.” At one point, a hiker informed me that Kara and her group were only 1.5 miles ahead of me, but that was with only about 3 miles remaining to the trailhead, and unfortunately, I couldn’t close the gap! 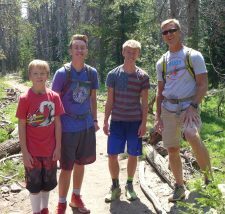 My Epic family hiked in to meet me when I had about two miles to go on the last day. They are the best! As I wrap this up, I’m also grateful for friendship, and the two new friends I made in Robert and Rick. I am looking forward to keeping in touch with them. I also am grateful for Nate, and for his skills and his leadership. Without him, I couldn’t have made this dream come true. 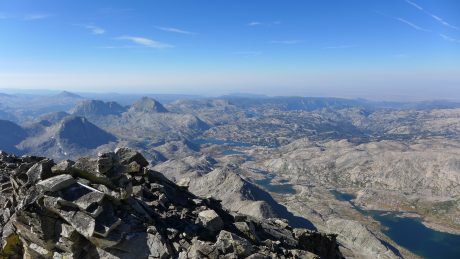 This blog post is my attempt to share about what I consider to be one of my most memorable Wind River epic adventures – time in Indian Basin and a climb up Fremont Peak. I apologize in advance for the blog post’s long length. But, as the saying goes, I would have made it shorter, but I didn’t have the time. I put this adventure together at the last minute when a work trip was cancelled. I invited my dear friend, Kathy Swanson, to accompany me, and she said Yes. And in 2012, my husband, Jerry, and I had taken a long day hike to Island Lake. 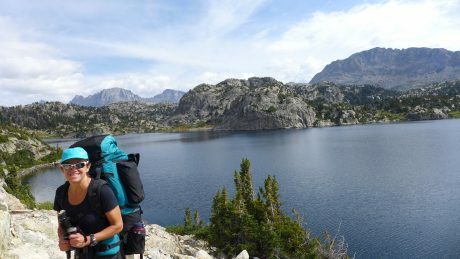 I remember taking in the views of the lake, and being awe-struck by the big mountains beyond the lake, which include Fremont Peak. I promised to one day return so I could go deeper into the area. Last weekend was my chance. The plan was to backpack in about 15 or so miles on Friday to Indian Basin, where we’d camp for 2 nights. 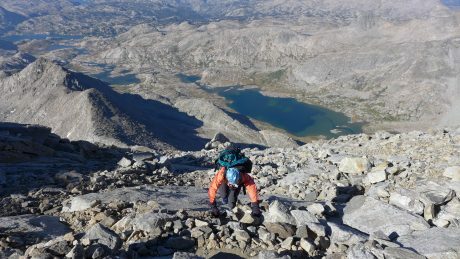 On Day 2/Saturday, we’d climb Fremont Peak, and on Day 3/Sunday, we’d backpack back out. 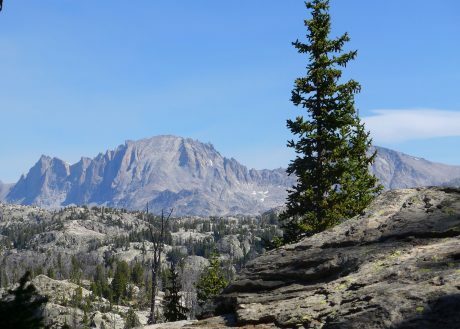 Fremont Peak is the third tallest peak in Wyoming, and the second tallest in the Wind Rivers. At 13,745′ tall, it’s just 64′ lower than Gannett, the tallest, and 31′ lower than the Grand Teton (which I’ve also climbed). 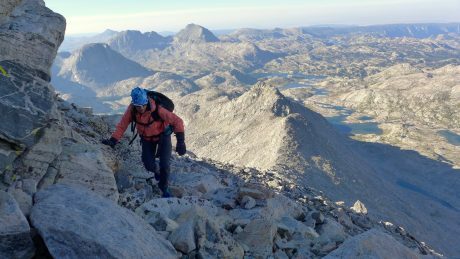 Fremont Peak is the tallest peak in Wyoming that doesn’t require technical skills or gear. The main reason I wanted to climb it is because directly on the other side of it (on its north side) is Upper Fremont Glacier, one of the largest and last remaining glaciers in the American Rockies. I couldn’t wait to look over the other side of the mountaintop to see that for the first time. We started at the popular and well-used Elkhart Park trailhead near Pinedale, WY. 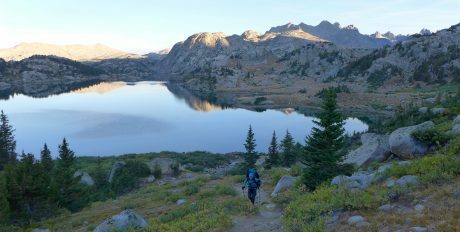 We started up the Pole Creek Lakes trail with our too-heavy backpacks at 6am, and made great time. After about four-and-a-half miles, we took our loads off and snapped some photos at an overlook called Photographer’s Point. “There’s Fremont Peak,” I told Kathy. “That’s the mountain we’ll climb tomorrow.” She didn’t say anything, and I think she purposefully looked away from the view at that point. At a little over five miles, we continued on the Seneca Lake Trail. Kathy, at about 5 miles into our 15.5-mile day. A major highlight of this route are all of the lakes you pass. We hiked past Eklund Lake, an unnamed lake, and Hobbs Lake, before reaching the stunning, and rather large, Seneca Lake. Kathy, at the beautiful Seneca Lake, reached after about nine miles. Kathy, hiking around Seneca Lake. The views of the mountains from Seneca Lake warrant a break, so we removed our packs and enjoyed a lunch break here before refilling our water bottles and continuing up. 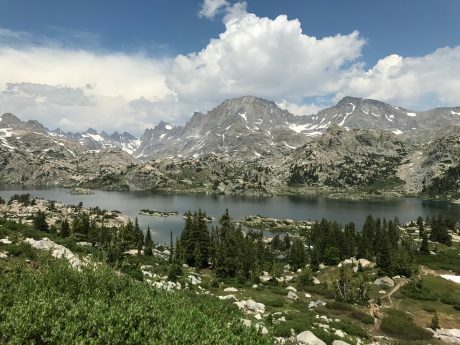 Shortly after Seneca lake, we hiked past Little Seneca Lake, and soon after, crossed over the Continental Divide Trail and continued up and toward Island Lake and Titcomb Basin. 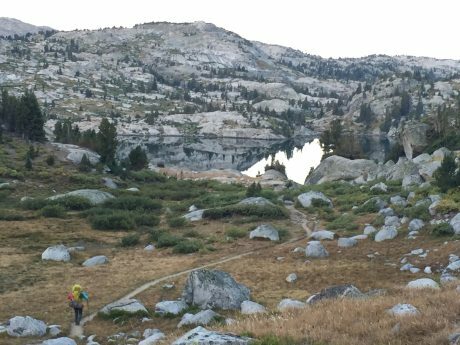 At about 11 miles, we reached Island Lake. Seriously – this is such a spectacular scene I always feel like I have to check the map to make sure we’re not in Heaven. It’s that spectacular. We took our loads off here briefly to take some photos and enjoy another snack. I also commented about the clouds over the mountains, which were building up pretty quickly. I knew there was a chance for some weather today, but was hoping we’d reach our destination before it came to pass. Kathy and I, posing at Island Lake. I should probably mention here that Kathy doesn’t consider herself a backpacker, nor does she want to be one. She’s a phenomenal athlete, and is very adventurous, and we share a love for long distance day hiking. Kathy and I both “grew up” in Lander, WY, but she’s a year younger, and while we had some friends in common in those early days, we weren’t very well acquainted. 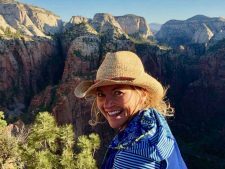 It wasn’t until she read about my Grand Canyon rim-to-rim-to-rim, and other epic day hikes, that she reached out to me. 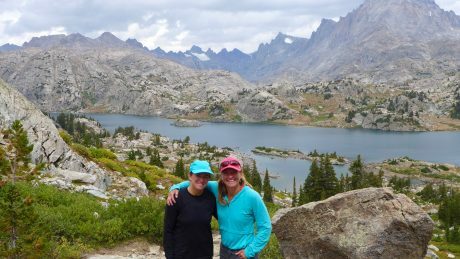 That was about six years ago, and Kathy and I have since shared the trail on many epic adventures, mostly epically long day hikes. 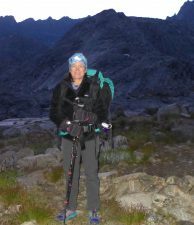 The night before this adventure, when Kathy tried on her borrowed – and loaded – backpack, she remarked with a few choice words I don’t want to print here, along with “my knees just buckled.” She wasn’t joking. Did I mention Kathy is a trooper? She’s one of the very few friends I call when I have something this epic planned, and on short notice. So far she has always said Yes. But for the record, and to be completely up front, had she said No, I still would have set out on this adventure. That’s how bad I wanted to experience Indian Basin and Fremont Peak. That said, I was thrilled I had a taker in Kathy, because we always have meaningful conversations, a lot of fun and laughter, and we both love pushing our limits. 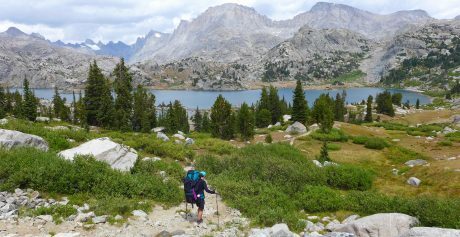 The reason I’m bringing this all up right here is that a little bit past Island Lake, about 11.5 miles into our backpacking adventure, I could sense that Kathy might be approaching that threshold at which things start to go downhill, and it’s not a lot of fun anymore. This has nothing to do with her fitness level and everything to with her borrowed, and heavy, backpack. Oh, and add to that she was experiencing significant pain in one of her ankles caused by her hiking boot. All that said, Kathy is one of the toughest people I know, and she has a awesome attitude. About this time I was also worried about the clouds that were developing, and how torrential rains and prospective thunder and lightning might wear on her (us) should those conditions present themselves. Kathy, leading us down the trail toward Island Lake. After hiking down to, and around, Island Lake, we made our way up the trail to the Indian Pass junction. Here, we took a right and headed toward Indian Basin. Shortly after the junction, we came upon a young couple, and I asked them if they had been in Indian Basin. They said Yes, and then they asked where we were headed. I told them we were headed into Indian Basin, and that we had plans to climb Fremont Peak the next morning. 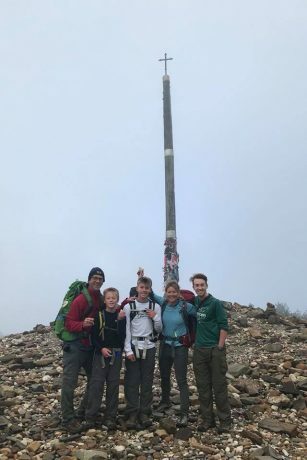 They shared that they had climbed it earlier in the day. 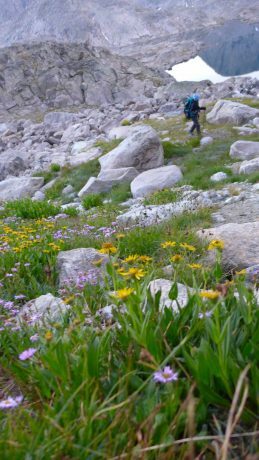 Kathy, heading toward Titcomb Basin, and specifically, Indian Basin. Almost to our destination, Indian Basin. That “bit of a climb” the man mentioned to us felt like Jackass Pass, one of my favorite high altitude trails and passes in the southern Wind Rivers near the Cirque of the Towers. Normally a high pass wouldn’t be that challenging for us, but this was coming to us with about 14.5 miles already on our legs, and too-heavy packs on our backs. Oh, and did I mention that those developing clouds were now expressing themselves? At this point, at about 2pm on on Aug. 26, the skies were spitting snow on us. Awesome. We sucked it up, and continued hiking up the trail in lightly falling snow. I stopped to capture a quick video and take in the moment. Although I would have preferred blue sky, the scene felt magical. When snow falls on an August epic adventure, it makes the whole experience more unforgettable. Kathy and I both agreed that snow was better than rain, and continued, but only after Kathy remarked, “Living the dream.” She took the words right out of my mouth. Because we had started our adventure early in the day and made good time, it was only 3pm as we rested in our tent while the snow fell. Kathy rested her sore neck, shoulders and legs, while closing her eyes. As for me, I reached for my book, Consolations, by David Whyte, and read two of his amazing essays in that book, Gratitude, and also, Beauty. About one hour later, I unzipped the fly, and peeked out. The snow-filled air was gone, and blue sky was emerging. We could see Fremont and Jackson peaks. Yeehaw! I thought to myself. I made an early Epic noodle dinner for us, and we ate it with gusto. I would share more about the recipe, but it’s complex, and I don’t want to give away my secret wilderness recipe. 🙂 We called it a night when it was still light out, and woke up (from not sleeping!) at around 4am. The big day was here. We were going to climb Fremont Peak. I love to start mountain climbs before the sun comes up. This is for the obvious reason. Starting early provides us with a bigger window and opportunity to climb a mountain in a place where weather can change quickly. The second reason, though, is I love to be under way when the sun comes up, and to experience alpenglow on the peaks we’re approaching. 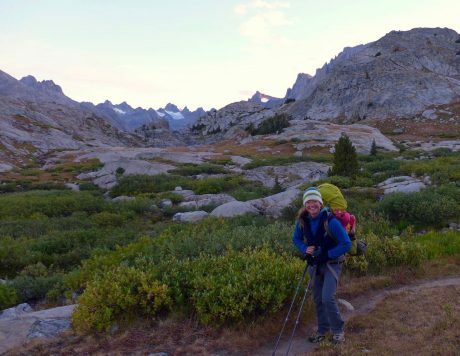 However, because this was all new country for me, and given Kathy’s – to use her words – “dread,” we opted to depart camp at first light so we could better see the terrain. So I had an extra two or three cups of coffee, while Kathy enjoyed a double hot chocolate, and we ate our breakfast bagels. Kathy, excited (not so much) about setting off to climb Fremont Peak. We had instructions from everyone I consulted with before this trip to head for the grassy saddle below Fremont Peak, so from our camp, we started traversing a slope at an angle oriented toward the top of the saddle. The lakes we passed were like mirrors – still, and reflecting the mountains above them. Kathy, scrambling over some rocks and tundra during early morning reflections in one of the lakes of Indian Basin. Kathy and flowers and a lake. 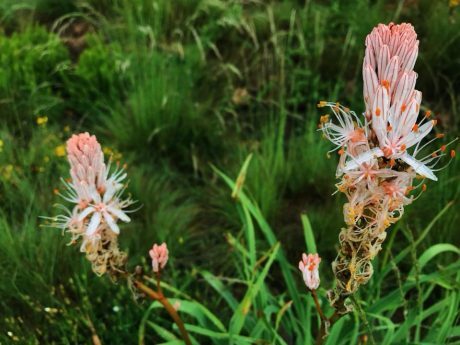 I didn’t expect to see many wildflowers on this trip since it was late August, but we were pleasantly surprised. 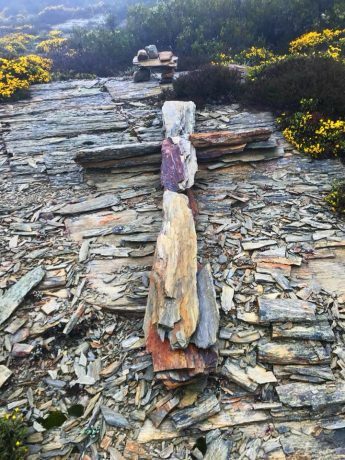 This was the terrain at the start of our mountain climb. That’s Fremont Peak, and this is the terrain leading to the saddle, which you see at just left of center in this photo. 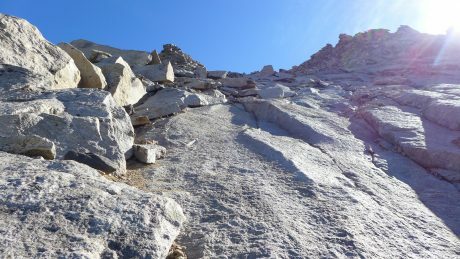 As we approached the saddle to Fremont Peak, the terrain was mostly rocks. We acted like mountain goats and made pretty good time getting to its top. Once at top of the saddle, we took some photos and I captured a short video. We snarfed a snack and guzzled some water and then found a trail, and followed it toward Fremont’s S/SW face. The “trail” petered out shortly due to the terrain being mostly rocks and not dirt or tundra. We spied some boot tracks here and there and used those to link routes up the mountain. Near the beginning of the climb up Fremont, when we stopped to find sections to piece together into a route, I found myself reflecting a bit on the previous mountains I had climbed. I remembered I was only 28 when I climbed Wind River Peak that first time. Today, I’m 48. That’s not helpful right now, I thought to myself. I’m not very young anymore. This caused me to recall a conversation I had recently with a friend, who is also 48, and how I reminded her, “You’re only 48.” I am so grateful for my health and abilities. To reassure myself, I recalled all of the hard training I have done throughout the year so I can embark on adventures like this one. 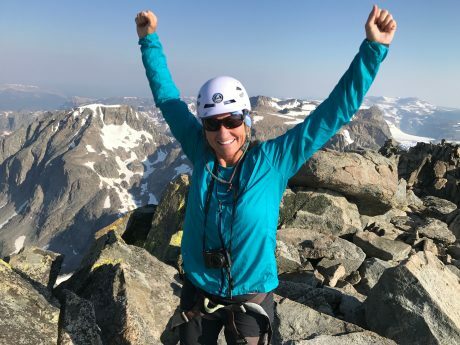 As I carefully selected routes, I was pushing my mental limits, feeling very aware of Kathy’s discomfort and fear, and also managing some of my own fears. One thing I’ve learned is that most, if not all, of us have an inner critic, and that critic usually shows up when we’re stretching our abilities. 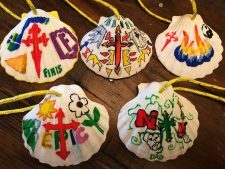 Instead of supporting us and encouraging us, our inner critic beats us down in an effort to get us to retreat “to safety,” to the status quo, to our comfort zones. The climb was not above my abilities, but the stakes in the wilderness, and up on mountains, are high, and I was constantly aware of what those stakes were, as well as Kathy’s trust in me. This made me a little teary-eyed, but (thankfully) my sunglasses concealed my emotions. I was part fearful, but mostly feeling blessed that someone would trust me enough to follow me. This caused me to be grateful for all of the people who sign up to work with me and follow me into the wilderness, and sometimes up mountains. That’s a lot of trust, and I don’t take it lightly. With only a few steps (moves) to reach the summit, I was filled with anticipation. I couldn’t wait to see what was on the other side. I love this stage of a mountain climb – when the summit is in reach, and you’re about to stand on it. Full of potential is how I would describe this state. I couldn’t wait to get a look at the Upper Fremont Glacier. 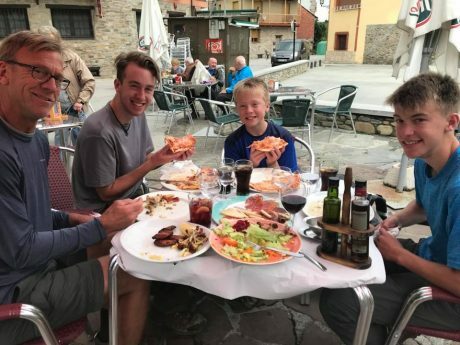 (In May and June, our family went to Europe, where we explored 7 countries in 30 days. One of many highlights was riding a train to the Gornergrat Glacier, above Zermatt, Switzerland.) I couldn’t believe I was about to get a close-up view of a glacier in my own backyard. And there it was, before me: Upper Fremont Glacier. I recalled the words of John C. Fremont, for whom this mountain is named. From Fremont’s 1842 Report: “I sprang upon the summit, and another step would have precipitated me to an immense snow field five hundred feet below.” Measuring about 690 acres, Upper Fremont Glacier is one of the highest altitude glaciers in the American Rockies. Looking over the summit’s edge at the great expanse of old snow was an experience I’ll never forget. The views from Fremont’s top are panoramic, the scenery in all directions, astounding. 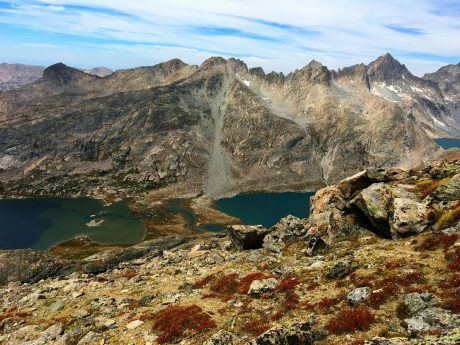 In addition to the glacier, we could look up (and down) the Continental Divide and see numerous granite peaks, and also, the many lakes that dot Titcomb Basin and beyond. Kathy and I hugged, and congratulated each other before capturing some summit photos and video. 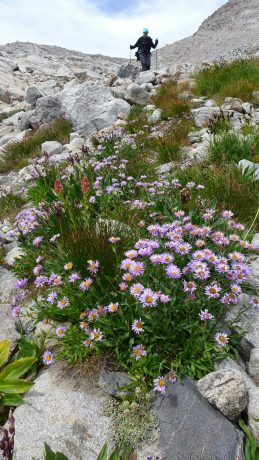 As if often the case in the Wind Rivers, and during other wilderness experiences, I was for a moment moved to tears. I was inspired by the spectacular beauty, feeling fulfilled by our accomplishment, and filled with gratitude. I remembered what I had read in the tent the day before from Consolations. 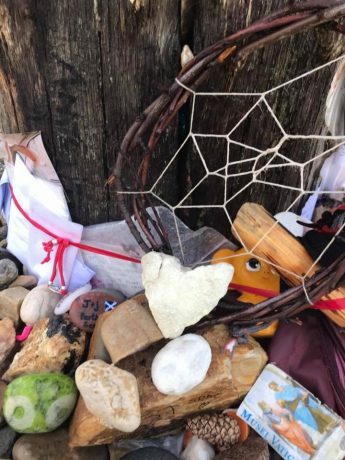 That gratitude isn’t a passive response to something we have been given, and that it arises from paying attention, from being awake in the presence of everything that lives within and without us. Kathy was also overcome with emotion, and used my cell phone to call her husband and daughter, and her parents. I also sent out some texts to special people, and then we snarfed some lunch while taking in the experience. Yeehaw! Kathy and I, on the summit. The view from Fremont’s top is epic. After about 45 minutes, we agreed it was probably time to start down. I always remember that the summit is only the halfway point. We still have to get down off the mountain. And based on our route up, I knew our descent could be more challenging than our ascent. We took it slow, and I reminded Kathy to be deliberate and to stay focused. I said these words often, and in order for both of us to remember. We took frequent breaks to keep our wits, to breathe, and to look up and take in the views. As we descended, we could see more of the mountains up north along the Continental Divide. Soon, we were back at the saddle, where now the tundra stood out in its brilliant early Fall colors. 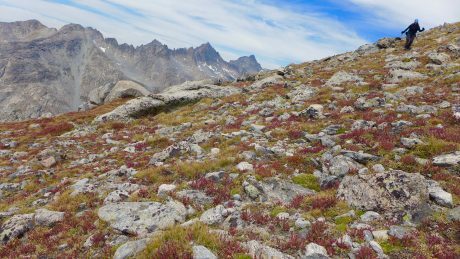 There were burnt red patches mixed in with golden tundra, and all around us were greenish-blue lakes, and tall gray granite mountains. The angle of the light on this landscape was breathtaking, and we couldn’t help but stop to soak in the scenery, and to enjoy it for a bit. Just about back to the saddle. Beautiful fall colors in the tundra. Here’s a screen capture of our route in Google Earth. One more lake to hike around before getting back to our tent. We found the trail, and descended the saddle toward the lakes in Indian Basin, and before long we were back at our tent. It was 2pm, and all we wanted to do was rest. 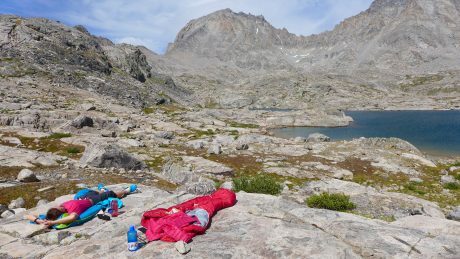 We put our sleeping bags on a flat granite slab, got horizontal, and rested under a blue sky, occasionally looking up at the mountain we had just climbed. Pointing to the top of mountain we climbed. I fixed us some Epic cheesy quesadillas with spicy tomatoes and we had a bit of a “Happy Hour,” made possible by some special treats we had hauled in. We watched as the sun started to set and marveled at the way the sun highlighted the mountain peaks. It was the perfect end to a perfect day. Our campsite was stellar. Evening alpenglow. Morning came early. Our third day would be a big one. We had to pack up our camp, and backpack 15.5 miles to the trailhead, then drive 2 hours to Lander, and then Kathy had an additional 2.5-hour drive to get home to Casper. We were on the trail before sun up, and we were rewarded accordingly. 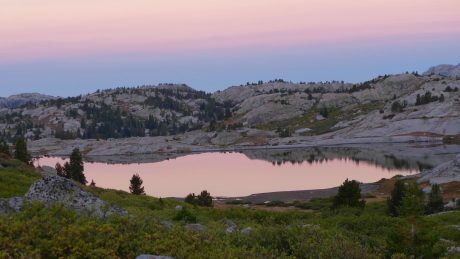 There was pink in the sky, and perfect reflections of the pink sky, granite and pine trees in the lake. Me, happy to be hiking at my favorite time of day – during sunrise. 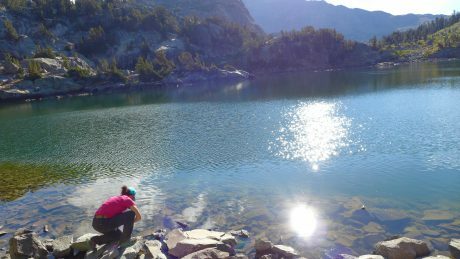 Kathy, ascending a trail above the beautiful Island Lake, with morning reflections. Unfortunately, once at Island Lake, I led us up a wrong trail. We ascended about 300′ and a quarter of a mile before I had a hunch we were on a wrong trail. Fortunately I realized my hunch was correct and we returned to the lake, skirted it for another quarter mile or so, and then ascended via the correct trail. Island Lake. One last look. Once above Island Lake, we stopped for one last look at this spectacular scene. It was almost 8am, so I figured I deserved a Snickers. As usual, it was delicious. 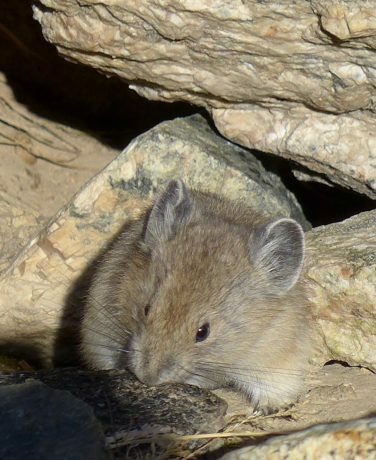 While stopped, we watched as a cute pika came out from under a rock. For the last 11 miles, we hiked pretty non-stop. We had places to go, and had got what we came for. We stopped briefly at Seneca Lake to refill water bottles, before continuing the rest of the way out. Refilling water at Seneca Lake. Fremont Peak, in our rearview mirror. We could make out the route we had climbed the day before. We were back at the trailhead, and our truck, by 2pm. We bought some chips and cold drinks in Pinedale and headed to Lander, stopping in Farson to get epic servings of ice cream. This was an adventure I’ll never forget, and one I highly recommend. If you can, though, add more days to the adventure so you can have more time to experience, explore, and enjoy what is truly a magnificent Wonderland. We did it this Epic Adventure in three days only because we had only three days of available time, and that is much better than zero days.